Over the past few months, I’ve heard people talk about making salads in a jar on numerous occasions. Being the skeptic that I am, I wondered why people would do such a thing. What’s wrong with regular plastic or glass Tupperware containers? But I heard enough about these salads that I decided to give them a try, and I have to say, I was surprised by how much I like them. 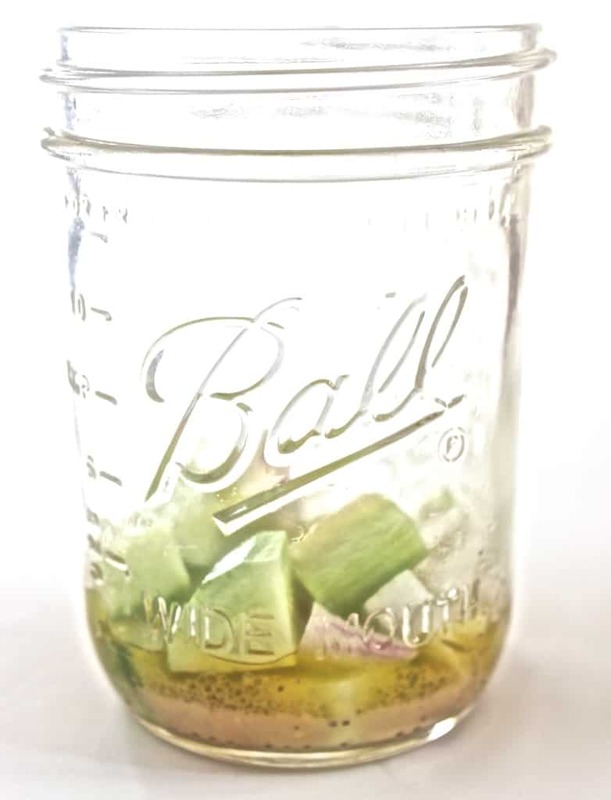 -The narrow design of the mason jar keeps the dressing on the bottom near the firm veggies, and the softer veggies, greens, and proteins are layered closer to the top of the jar where they won’t get soggy from the dressing. -With a glass jar, you don’t have to worry about possible harmful effects of BPAs (although it is possible to buy BPA-free plastic containers). 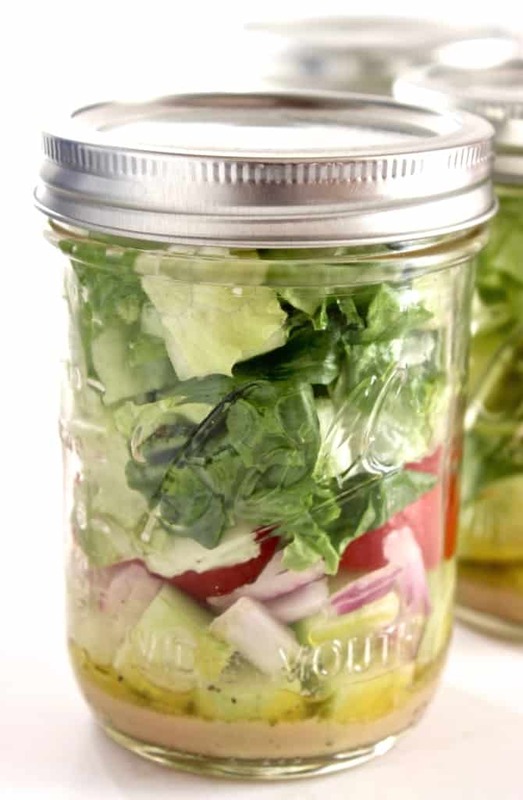 -Mason jar salads stay good for up to 5-6 days in the fridge so you can make them during the weekend for a whole week of lunches, which is longer than any of my Tupperware salads have lasted. I bought a set of a dozen wide-mouth (<- important for ease of filling) pint-size mason jars at Walmart for about $13. I’ve also seen them at Kroger, Ace Hardware, and quite a few other stores. Of course, like most things in the world, you can find them on Amazon.com, too. What do you put in them? There are lots of possible variations for mason jar salads and I’ll list a few at the bottom. The most important thing to remember is liquids on the BOTTOM and soft, delicate ingredients on TOP. 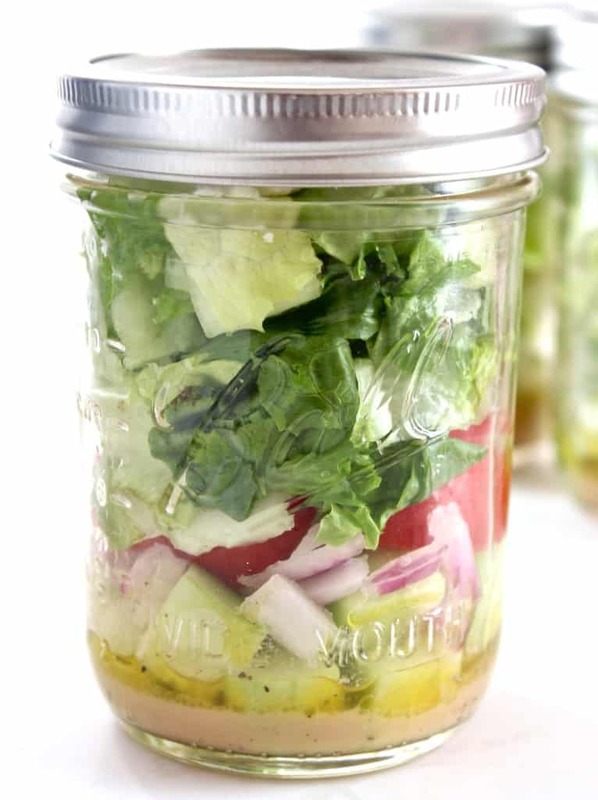 For now, I’ll show you a step-by-step of how you can make a Greek mason jar salad. Layer 1: Pour 1-2 tablespoons of salad dressing at the bottom of of your pint jar. Layer 2: Add beans (if using) and then your harder, least absorbent veggies. For the Greek salad, I used red onion and cucumbers. Chickpeas and slices of bell pepper would also be great here. Layer 3: Add soft veggies if eating the salad that day. This time, I added sliced tomatoes, but if I knew I wouldn’t be eating the salad for several days, I’d wait to add tomatoes to the top layer on the day I planned to eat it. Olives would also be a great addition here if you’re into those. Step 4: Pack most of the remaining jar space with greens. Here, I used Romaine lettuce, but you could also use mixed greens, spinach, or kale. Step 5: Add proteins (meat, tofu, tempeh, etc.) and soft cheeses on top on the day you plan to eat it, and pack the jar tightly before screwing on the lid to keep the layers in place. I added feta cheese and grilled chicken to the top of my Greek salad. 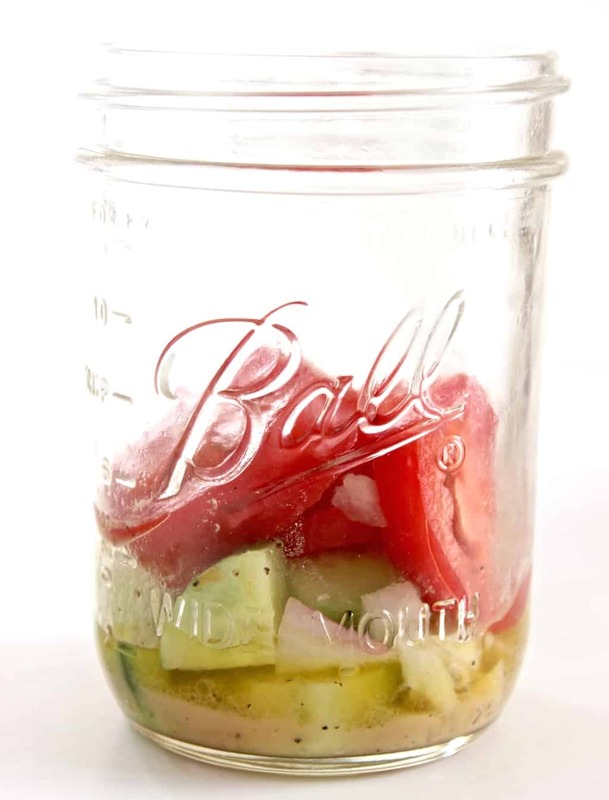 Create one of the mason jar salad variations above, or follow these loose guidelines to make your own. Layer 8: Cheese and proteins: Feta cheese, diced chicken, tuna, hard-boiled eggs. If you're making salads ahead to eat throughout the week, wait to add these ingredients until the day you're planning to eat the salad. 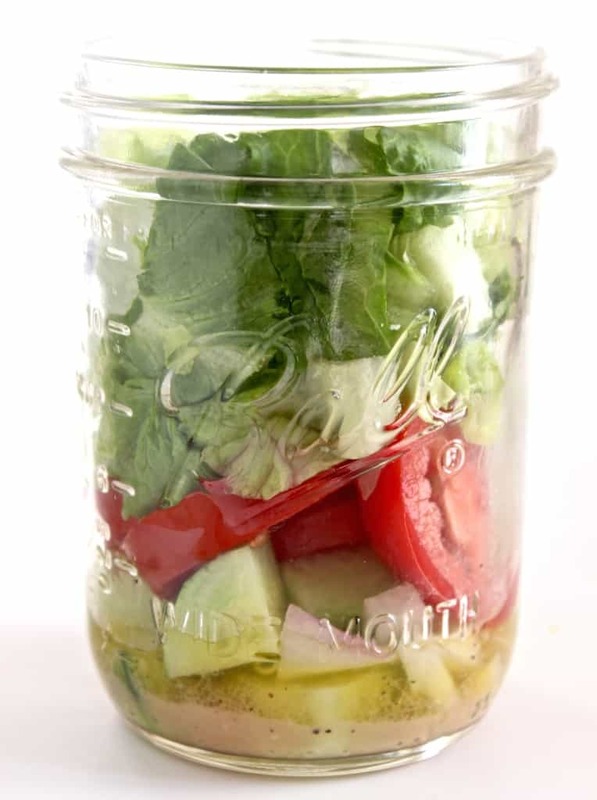 Storing the salad: Screw the lid on the jar and refrigerate for up to 6 days. If you're including any cheese, proteins, or soft fruits and vegetables, add these to the top of the jar the morning you plan to eat your salad. Tossing and eating the salad: When ready to eat, unscrew the lid and shake the salad into a bowl. 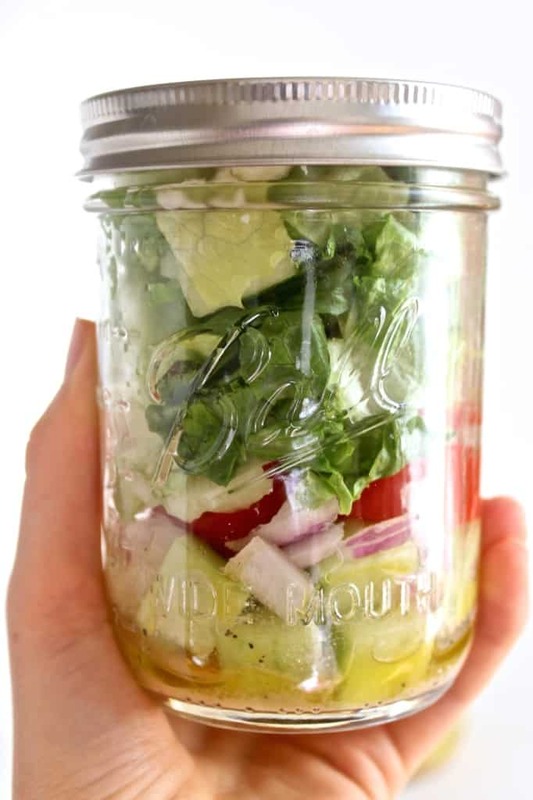 Use a wide-mouth mason jar to be able to easily pack your salad. Mason jar salads are so fun! I haven’t made one in a long time, but need to start experimenting with different ones again. I always thought it was just one of those silly trends too haha but now I’m a convert! 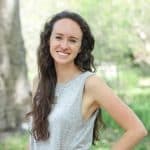 I was a mason jar skeptic until just recently too! I always just stuck with my plastic tupperware, but now that I started experimenting with mason jar salads, I am totally on board with it. I am loving the southwestern variation you made— going to have to try that out next! I really like the Southwestern version! And I love that mason jars can be heated up in the microwave because I never feel good about microwaving plastic. Mason jars are great since they’re microwave-safe, too! Love that you broke it down step by step! Makes it so much easier to do. Another benefit of mason jars is you dont have to worry about bringing another container of dressing on the side. Very true! I love just having one container to carry around and then wash later. After I eat a few bites from the top of the jar, I can usually shake the salad up to mix it without even having to dump it into a bowl! 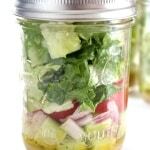 I eat salad almost all the time.. and I’ve never made a Mason Jar salad!! I’m clearly doing something wrong here! You have made some great points! I send my husband to work with one most days and he loves them. I have never made a mason jar salad because I always thought it wouldn’t be filling enough (the jar looked too small to fit enough food in). But I LOVE the idea behind it so I might just have to buy bigger jars haha. You have answered my most burning mason jar salad questions! I have a pantry full of mason jars but I wasn’t ready to take the plunge… Thanks for the information. I was definitely confused about eating the salad out of the jar. Dumping it into a bowl makes so much more sense! I still need to make a mason jar salad! Making one asap! I’ve been making a few mason jar lunches on the weekends- either salads or burrito bowls- and they’ve been so nice to have! My favorite mason jar has a logo of a tough mudder I did! I haven’t hopped on the mason jar salad trend yet, but I definitely should! I always carry my dressing separately in like a small tupperware, but this seems so much easier!.